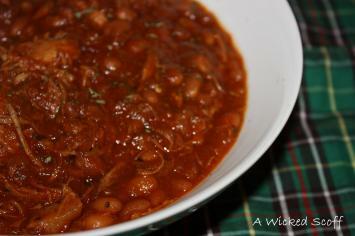 Here at A Wicked Scoff I'm always thinking about how I can take traditional Newfoundland or New England ingredients and use them in a new and unique way. Living here in the Boston States I do not have a full arsenal of Newfoundland fare at my disposal but I do have special products that let me get my creative culinary juices flowing. Down to my last couple pint-sized Mason jars of my uncle's bottled moose (from central Newfoundland), I decided to try something special. I wanted to build off my last bottled moose creation, the moosewich dip, and go more outside the box. 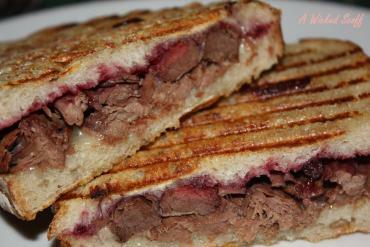 I know that red meat, and especially game, go great with tart berries, wine and port so I utilized a couple other Newfoundland ingredients and came up with a tasty moose panini sandwich. I paired the tender morsels of moose with some tart partridgeberry jam (aka lingonberries in other parts of the world, notably in Scandinavia or at IKEA stores) and sharp aged cheddar cheese. I made these grilled sandwiches on some wonderful, locally made rustic sourdough bread, for even extra tang and a great chew. Any kind of good quality bread would be great though. Not wanting to throw away and waste all the moose bottling liquid (referred to as moose liquor from this point forward), I paired it with some Newman's Port. I drizzled the port moose liquor reduction around the plated panini and dipped some of the bites into it for an extra fruity, salty burst of flavour. Here are some pictures and how I put it all together. First off, if you do not have a panini press, don't sweat it. These sandwiches can be made in a skillet just as you would a grilled cheese or even on a cast iron griddle. If you want the panini effect of the sandwich getting pressed add a heavy pan to the top of the sandwich to press it a bit. To start, place the contents of your bottled moose in a small skillet (I use a skillet as opposed to a sauce pan as this will help with the reduction later). Heat the moose and liquor through over a medium heat. I like to have the moose warm on the sandwich instead of putting it on there cold. Next, plug in your panini press and let it get hot. 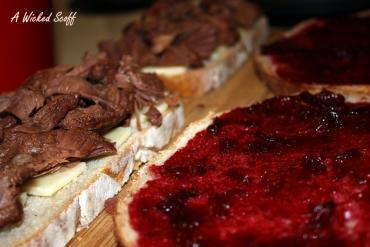 Lay out your four slices of bread and begin to assemble the sandwiches. Spread 1 tbsp of the jam on two slices and cover the other two slices with thinly sliced sharp cheddar cheese. Next, divide the tender moose meat atop the slices with the cheese. There should be enough moose to sneak a couple pieces into your mouth as a little snack. Lay the jammed slice of bread onto the moose/cheese slice and you're all set. Open your panini press and spray both sides with nonstick spray or oil. Lay on the sandwiches and press down. Cook according to your machine's directions or until browned, crispy and heated through. I let the paninis rest for a couple of minutes (they're too hot to eat) while I make the reduction. Bring the reserved moose liquor to a boil and add a 1/4 cup of port. Stir together and let reduce until it becomes syrupy and coats a spoon. Use this reduction to drizzle around your plated panini for dipping. This sandwich was a huge hit at home the other night and I'm sure it will be for you and your friends and family too. 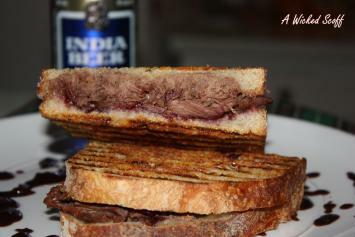 Paired with a nice glass of Rodrigues wine or cold glass of beer and you'll have a great combination. So here you have it, two of Newfoundland's best ingredients, moose and partridgeberries together again, just as they are in nature out on the barrens. Monday Jan. 24, 2011 I eat a lot of salads these days. Not only are they very good for me, but I really love them, and actually get cravings for a made salad. There are two primary benefits of eating salads. The first is obvious; it's a great way to get a load of vegetables into your body at once. Great if you've been having a carb, dairy and meat type of day. Secondly, if you eat a salad as a first course to dinner, you're less likely to overeat on the stuff you shouldn't be overeating (think being too full to have a second helping of mashed potatoes). As I said though, I mostly like salads because of the taste, but I suppose another reason is because they are so easy to put together, especially on a work day evening, when time is of the essence. When I'm really looking for a one-dish meal, I often turn to a salad chalked full of veggies and topped with some grilled protein like chicken, steak or tuna. The key to pull this off is to have a well-stocked fridge of salad toppings, both fresh and bottled, and to have fresh or thawed protein ready for a quick after-work marinade. 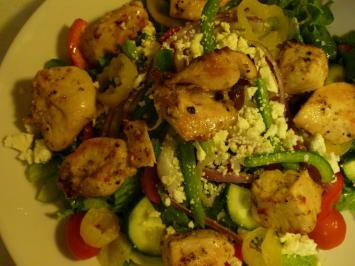 My favourite go-to salad is a Greek Salad, with lemony grilled chicken breast. With a supply of fresh vegetables such as lettuce, tomatoes, lemon, red onion, cucumber and bell pepper, along with bottled toppings including olives, artichokes and various peppers, as well as feta cheese, I'm all set for making a salad and a homemade dressing. All I need to do is remember to take some chicken breast out of the freezer in the morning before work, make a quick marinade after work, go walk the pup or workout, get home and start cooking. Within 20 minutes I'm usually sat in front of the TV watching the game, with a big bad salad in my lap. Here's how I make it. Greek Salad Dressing 1 cup extra virgin olive oil 1/4 cup red wine vinegar Juice and zest of 1 lemon 1 tsp Dijon mustard 1 clove garlic, crushed 1 tsp dried oregano Pinch of kosher salt and a few cracks of black pepper Add all ingredients to a jar with a tight-fitting lid, and shake vigorously until dressing is a well-combined homogeneous mixture. For my Greek salads I like to pre-dress my greens with the salad dressing before plating, and I add my salad fixins afterward. This ensures the right amount of dressing is used, and also completely covers each piece of lettuce. I measure out the right amout of lettuce on the salad plates and then return the lettuce to a large bowl. Add some salad dressing (not too much) to the lettuce and toss together with tongs. If you need a little more, add as needed. Arrange "dressed" greens to plates and top with salad fixins. For my Greek salads, I like the classic essentials; sliced cucumber, cherry tomatoes, red onion, feta cheese, Kalamata olives and peperincino. I also go for some seasoned croutons, marinated artichoke hearts, fresh red bell pepper strips and cherry peppers. You really can't go wrong with whatever fresh vegetables you have. Top with the grilled chicken and you have a super-healthy and protein-packed salad that makes an awesome meal. Grilled/Broiled Greek Chicken Breast 1/4 cup extra virgin olive oil Juice and zest of one lemon Tsp dried oregano Pinch of hot red pepper flakes 2-3 boneless, skinless chicken breasts, cut into large chunks (chicken nugget size) Mix first four ingredients for marinade in a small bowl with a whisk. Add chunks of chicken to a zip bag or glass dish and cover with marinade. Marinate chicken for at least 1 hour before grilling or broiling. When ready to cook, preheat your grill/broiler and cook chicken until done, turning as necessary. Should take 5-7 minutes. Let chicken rest for a few minutes and add to your salad. Also makes a great stuffed pita or wrap. Read more here: http://awickedscoff.blogspot.com/ About Me...The Wicked Newfoundlander I'm originally from Newfoundland, Canada, and very proud of it! I moved to upstate New York in 2007, and I spend much of my time working and playing throughout New England. Besides my wife, our dog and hockey, I'm passionate about food. I love to cook and create great tasting food. I also love tasting and critiquing food, and comparing regional cuisine (notably Newfoundland and New England dishes). Sun. Dec. 12, 2010 Last week I saw a picture of shepherd's pie in a Williams Sonoma catalog, and I ultimately began craving a hot plateful of this comfort food classic. This traditional English or Irish meat and potatoes pie is quite popular here in New England, and as far as I can tell it is a well used go to meal in Newfoundland kitchens. 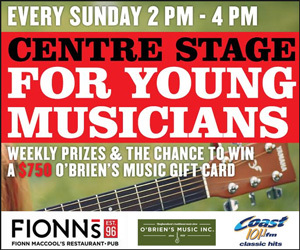 With both Newfoundland's and New England's connection to Ireland and England, this should of course come as no surprise. I don't know why but for whatever reason, I have rarely had shepherd's pie. I guess it just wasn't something we had much. While I always see it on the menus of restaurants and pubs, I always end up ordering something else. After seeing that picture last week though, I knew I had been missing out. Before tying my hand at making this old world dish, a little research was in order. My elementary understanding of shepherd's pie was that it consisted of well-seasoned ground beef mixed with onions, carrots, peas, and other vegetables, topped with mashed potatoes, and sometimes with or without cheese. 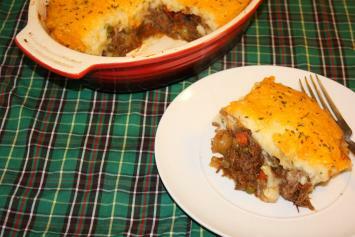 In actual fact though, by definition, shepherd's pie contains lamb, and its beefy cousin is referred to as cottage pie. Whatever. The dish likely originated not by using fresh ground meat (beef or lamb), but instead by using leftover cooked meat. Since I was using beef and not lamb, I decided to give the historical character of the dish some homage by using slow cooked chuck roast, which I braised with vegetables and shredded  which in essence mimicked the leftover meat element (only much better I think since I gave it a lot of TLC). Once I had the meat figured out, I needed to determine how I would pick the other ingredients. To the meat mixture I chose to add pearl onions (mini onions you can find in the frozen vegetable section of your grocer), carrots, peas (the classic New England variation uses corn) and garlic, with additions of beef stock, Worcestershire sauce, red wine, a little tomato flavour and herbs. The potato layer consisted of mashed potatoes. I kept it fairly simple, but made them light, creamy and flavorful by adding a little butter, milk, garlic, some Parmesan cheese and salt and pepper. Lastly, the question of whether or not to add cheese on the top, was not even a question at all. Keeping with the English theme, I chose cheddar, and an orange sharp aged cheddar at that. The batch I made was enough to make two medium sized casseroles, and might just fit in your largest lasagna dish. As you can see in the pictures, I used two smaller pans, but this recipe would also work great if divided into individual gratin dishes...pub-style. You can also freeze either the beef and vegetable mixture, or freeze a fully assembled pie and thaw and cook when you're ready. I have to say, this was one of the tastiest and most satisfying dishes I have had in a while. It was so good in fact I had it for supper, lunch and supper again over two days, second helpings not included. Here's how I did it. Ingredients:  3 lb chuck roast (or use ground beef and saute with veggies instead of slow roasting)  3 large carrots, diced  1 lb pearl onions (or two large yellow onions, diced)  4-6 cloves garlic, crushed  1/4 cup beef stock  1/4 cup red wine  3 tbsp Worcestershire sauce  1/4 cup of chili sauce (or ketchup)  Dried herbs (or fresh) such as savoury and thyme  1 cup of frozen or fresh green peas  About 2-3 lbs of potatoes (8 medium)  4 tbsp butter  1/4 cup evaporated milk or milk  Grated Parmesan cheese  Grated sharp cheddar cheese  Salt and pepper  2 tbsp vegetable oil Directions: Preheat oven to 300 degrees F. In a large heavy-bottomed pan or Dutch oven, heat vegetables over medium-high heat. Trim excess fat and silver skin from chuck roast, and cube into pieces no larger than 2 incheswide. Adding a few pieces at a time, sear the beef in the hot oil. Cook the beef in small batches to keep the oil hot as you want to brown the beef and not steam it. Once all the beef is browned, return it all to the pot and add onions, diced carrots, garlic and season with salt and pepper. Add about 1 tbsp of dried herbs (more if fresh) such as savoury, thyme or rosemary. Mix well and deglaze the pan with the Worcestershire sauce, red wine and beef stock. Add the chili sauce or ketchup, stir, cover, and cook low and slow in the oven for 2 1/2 to 3 hours. Remove from the oven and using a pair of forks, shred the beef, pulling it apart. The excess liquid should get reabsorbed into the tender beef. Add the peas. This entire process can be done the day before (as I did) and assembled into pies the next night prior to supper. For the topping make your favourite mashed potato recipe. I boiled my spuds in some salted water and mashed them with a little butter, milk, salt, pepper, parsley, grated Parm and some leftover roasted garlic cloves. They were light and fluffy. To assemble the pies, spread a layer of the meat and vegetable filling on the bottom of whatever dish you like to use. Try to get at least an inch of filling. Top with hot mashed potatoes, spread with a butter knife and top with as muchcheese as you think you deserve. I was a good boy last week so I went down the extra cheesy road. I recommend that route! Bake in a 350 degree F oven for about 30 minutes. Let rest a couple of minutes before slicing and eat your heart out. This pie is deadly! While I put a lot of extra work into this version by searing and slow cooking, and shredding the chuck roast, I think it was the way to go. However to be fair, I plan on making a weeknight friendly version with ground beef or ground lamb (or even meatloaf mix, which has ground beef, pork and veal) just to see if the extra work is worth it. I'm sure it will be good as well. Stay tuned, and in the meantime, feed your cravings! Read more here: http://awickedscoff.blogspot.com/ About Me...The Wicked Newfoundlander I'm originally from Newfoundland, Canada, and very proud of it! I moved to upstate New York in 2007, and I spend much of my time working and playing throughout New England. Besides my wife, our dog and hockey, I'm passionate about food. I love to cook and create great tasting food. I also love tasting and critiquing food, and comparing regional cuisine (notably Newfoundland and New England dishes). Thursday, January 6, 2011 With a new year, comes new resolutions. For many people, these "resolutions" revolve around food and diet. For me, one thing I am making a conscious effort to do this year is to make more posts featuring wholesome and healthy foods. While I maintain a pretty healthy diet, that may not seem so obvious all the time here at A Wicked Scoff. However, many of the posts I make are actually weekend "treats" and not my everyday diet. Besides posting healthier options, another goal of mine is to take recipes and make them even more nutritious than they already are by making subtle changes such as using leaner cuts of meat, adding fibre through the addition of beans, wholegrains or brown rice, and by getting as many fruits and vegetables into recipes as possible. A great example of this is a chicken and rice soup I made earlier this week and will be featuring in a blog post next week. Besides the standard chicken, onion, celery and carrots that I put in any chicken soup, I boosted the wholesomeness by making my own chicken stock, using brown rice instead of white rice, and also by adding kale, a dark green leafy vegetable that is super healthy and packed with essential vitamins. Just to give you a preview, it was one of the best pots of soup I have ever made. It was impossible to tell the difference between the rice (brown not white), and the kale was mild and undetectable in the flavour. The whole thing blended beautifully and it made for hearty guilt free lunches all week long. So, with that being said, my first idea for a homemade healthy recipe is granola. I love granola, but have never tried to make it before. It is very healthy, full of great ingredients such as oats, nuts and dried fruit, but it is usually pretty expensive to buy, especially the organic stuff. After doing a little Internet research on some different recipes, I had a good idea of proportions of the ingredients and appropriate cooking times. Here is what I came up with. Maple-Nut Granola Ingredients: 1/4 cup vegetable oil 2/3 cup pure maple syrup 2 tbsp honey 1 tbsp pure vanilla extract 4 cups rolled oats (old fashioned, not the quick cooking) 1/4 cup wheat germ 1 cup of mixed nuts, rough chopped (I used a mix of pecans, almonds, cashews, hazelnuts, brazil nuts) 1/4 cup slivered almonds 1/2 cup shredded coconut 1 cup dried fruit (I used half dried cranberries/half raisins) pinch of salt Directions: Preheat oven to 250 degrees. In a small saucepan, heat the maple syrup, oil and honey over medium heat. Cook until warmed through and all the ingredients are well incorporated. Remove from the heat and add the vanilla extract. In a large bowl, combine all the dry ingredients, with the exception of the dried fruit, mix well and add the warm syrup mixture. Combine well and spread the mixture evenly over a cookie/baking sheet. Bake for approximately 1 hour and 15 minutes. Stir the mixture every 20 minutes or so to ensure even browning. Remove from the oven, pour in a large bowl and mix in the dried fruit. 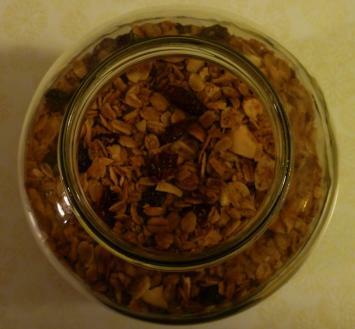 Store the granola in an airtight container. Will last at room temperature for 2 weeks, but I really doubt there will be any left by then. Use the granola as an additive to your favorite cereal, a topping to fruit and yogurt parfaits, or as a snack on its own. I know you will enjoy this one, and feel free to experiment with the fruit and nuts. Read more here: http://awickedscoff.blogspot.com/ About Me...The Wicked Newfoundlander I'm originally from Newfoundland, Canada, and very proud of it! I moved to upstate New York in 2007, and I spend much of my time working and playing throughout New England. Besides my wife, our dog and hockey, I'm passionate about food. I love to cook and create great tasting food. I also love tasting and critiquing food, and comparing regional cuisine (notably Newfoundland and New England dishes).